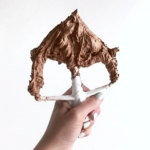 One of my friends described this chocolate buttercream perfectly: it’s the kind you have to put in the sink and cover with water so you don’t eat the whole bowl. I think she’s totally right, because time and time again I find myself eating this stuff by the spoonful. I’m a huge fan of all things chocolate, so it doesn’t surprise my that this is my favorite buttercream of all. Yes, those are strong words, but this is how I feel. The funny thing is there isn’t anything fancy about the process of making this buttercream or the ingredients involved, but the end result is amazingly tasty! It’s a simple American buttercream with cocoa powder added. I always opt for Hershey’s natural unsweetened cocoa powder for this one, but any unsweetened cocoa powder will do just fine. One thing to note about this recipe is that as soon as you finish whipping it up, the color looks like a light brown at first, but then ends up looking darker as the cocoa powder starts to saturate it. The end result is something more like the medium brown below. 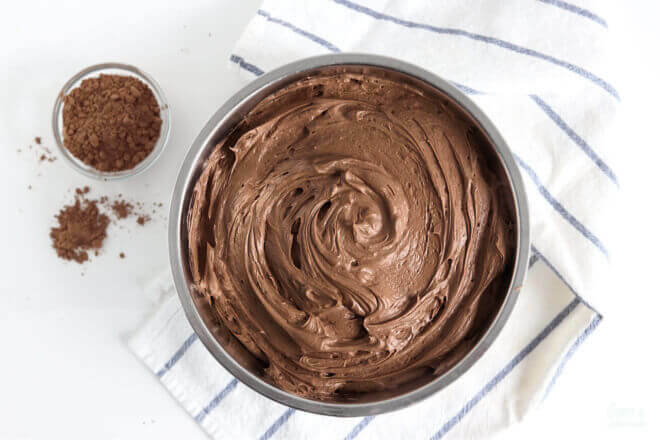 You can pair this chocolate buttercream with just about any cake flavor that goes well with chocolate. My all-time favorite cake combination is pairing this chocolate buttercream with this chocolate cake recipe. I am pretty biased because I’m a huge fan of all things chocolate, but trust me on this one – it’s perfect! 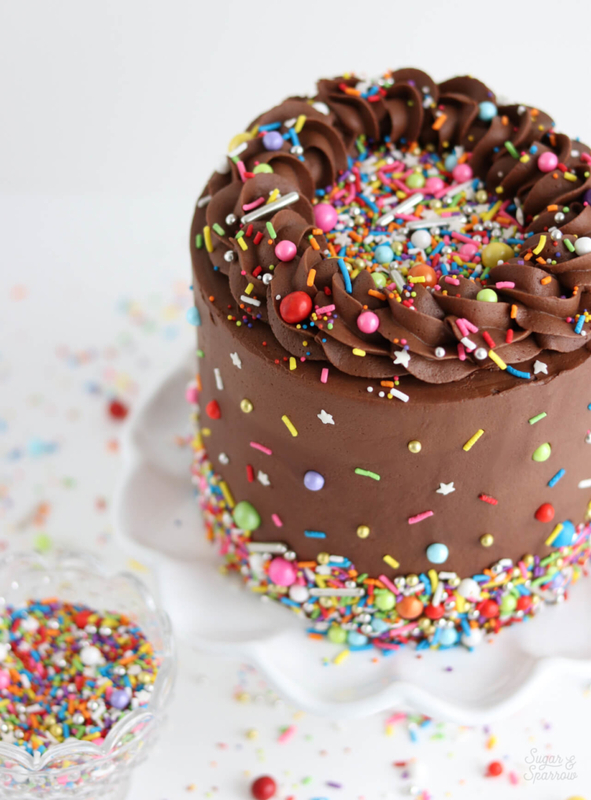 But beware, whatever cake you top it with, you’re gonna want to eat the extra by the spoonful. Consider yourself warned! 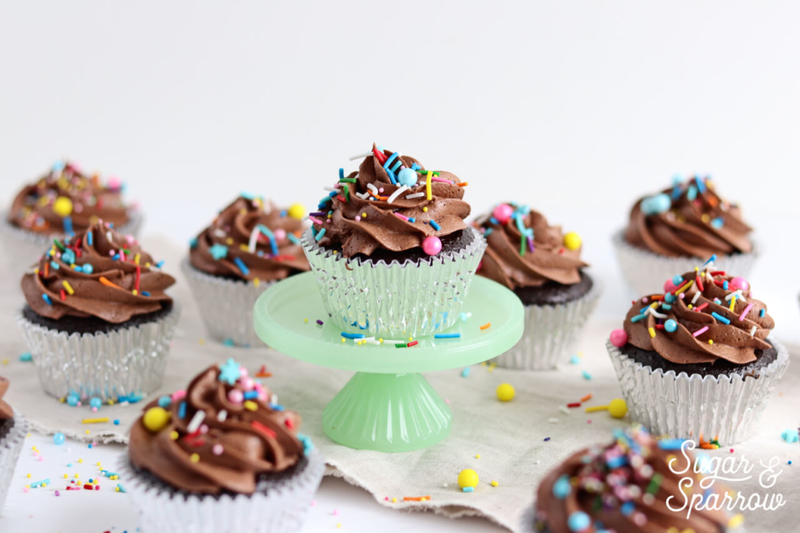 A decadent chocolate buttercream that’s so easy to whip up, but yields amazingly tasty results. Pair it with chocolate cake for the ultimate chocolate-lover’s dessert. In a stand mixer fitted with a paddle attachment, whip butter on medium speed until creamy and light in color, about four minutes. Scrape down the bowl and paddle and turn the mixer to low, then add powdered sugar, cocoa powder, milk, salt, and vanilla extract. Increase the speed to medium and beat for two full minutes. Make Ahead Tips: this buttercream can be made ahead and stored in an airtight container at room temperature for up to 1 day. Alternatively, you can store it in an airtight container in the refrigerator for up to two weeks. 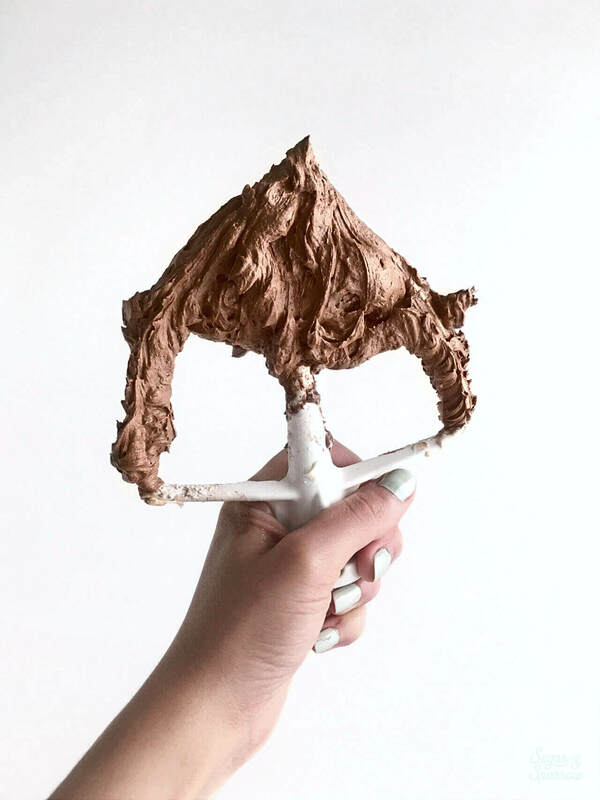 When you’re ready to use it, bring it back to room temperature and rewhip with your stand mixer to bring back to frosting consistency. nice consistency but insanely sweet. I usually use Italian buttercream so that might be why. Hi Marie-Anne! Yes, American buttercream is the sweetest of all buttercreams, so if you’re used to Italian buttercream it’s going to seem really sweet. You can try decreasing the amount of powdered sugar by 1/2 cup and adding a little more salt to balance things out if you want to try again!